I remember the first time I went to Paris, distinctly. I was a penniless graduate with little or should I say no budget. I got cheap flights to Paris with a budget airline for the grand sum of twenty Euros - that's all I needed, I was there. Some might snivel at going to Paris with hardly any money - I mean you can certainly spend it in one of the most charismatic cities in the world, if you have it. But for me Paris has a unique charm all of its own. Yes, you can shop till you drop in boutiques, drink champagne on the Champs Ely sees, and eat some of the best food in the world in top class restaurants. For me, the charm of the city was in the streets, the architecture, the museums, the artists, the old flaky antique bars and dim lit, rustic but inviting restaurants. Of course, having no budget limited me somewhat but to be honest after being in Paris many times, on no budget and staying at top notch hotels and having money, my first visit is still my fondest. One fond memory is the restaurants. Having had the experience of eating in some of the best Michelin starred restaurants in Paris, I can count myself lucky. 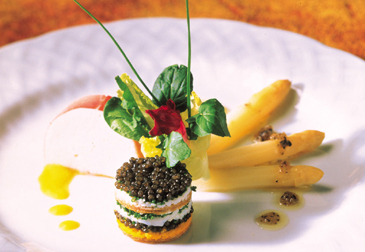 To experience fine dining at its best like this is something you don't forget in a hurry. To be honest though, even with a small budget you can eat great French food in an intimate, quaint, French bistro. I have had plenty of these dining experiences in Paris and they remain some of the fondest memories. When I first arrived in Seoul, I started searching for an authentic French restaurant. Then I found Seasons in the Hilton. This fine dining restaurant serves the best of French fare. On arrival the restaurant is classical, intimate and dimly lit - just like a French restaurant should be. As it's based in the luxury giant Hilton, Seasons is known for it's award winning chefs and the finest French cuisine in Seoul. It has a level of service that is second to none and customer's needs are paramount. The decor may seem tired to some and a bit in need of an update but we are talking authentic French here. We started with tuna and avocado tart and goose liver to start. They arrived looking delicious and the servings were generous for a starter. The tuna was tasty with a light mint and coriander dressing. For the main course, we ordered the steak and lobster thermidor. The steak was smothered in a delicious mushroom and peppercorn sauce and came with lightly buttered vegetables. The lobster thermidor really was the star of the show though. 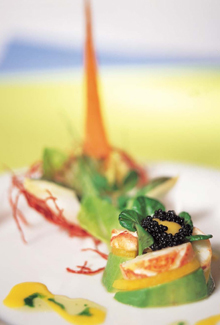 A whole lobster split in two and dressed in Gruyere cheese on a bed of salad and vegetables. Every bite melted in the mouth, it was cooked to perfection. Coupled with the Marlborough New Zealand Sauvignon Blanc, the fresh seafood and citrus flavors of the wine fused together well. For dessert, we tried a cheeseboard and a mille fleur plate to share. The cheeseboard had three cheeses and biscuits which was a savory alternative including garlic roule, brie and blue cheese. The millie fleur was a combination of strawberry based petite desserts on a glass plate including a vanilla cream pastry, white chocolate covered strawberry, and fresh strawberry ice-cream. The desserts topped off the meal nicely, and weren't too heavy after the dining experience. Everything is so easy in Seasons, the service attentive, the food authentic, and the ambience relaxed and intimate with tables spaced nicely apart. There were no eccentric Parisian characters but Seasons serves excellent food in a spacious and elegant setting. The food is presented with a charisma that only the French are famous for. It really is a little pocket of Paris in Seoul. Goodbye Paris, ah well, C'est La Vie. The Seasons restaurant is situated in The Millennium Hilton. Get off at Seoul Station and take Exit 8. To make reservations call (02) 3173205 or www.hilton.com for further information.